Source: U.S. Energy Information Administration, Syria Country Analysis Brief. Syria, the only significant crude oil-producing country in the eastern Mediterranean, produced 387,000 barrels per day (bbl/d) of crude oil (including lease condensate) in 2010. 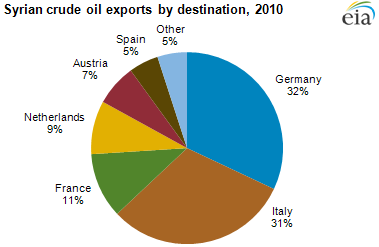 Estimated net crude oil exports were 109,000 bbl/d in 2010, the vast majority of which went to OECD European countries. Germany, Italy, France, and the Netherlands comprised over 80% of Syria's crude oil exports. According to the European Commission, European Union (EU) countries imported 1.35% of their petroleum from Syria in 2010. Although exports from Syria represented a small share of the EU's overall oil needs, these exports accounted for 30% (or $4.1 billion) of Syrian government revenues in 2010. 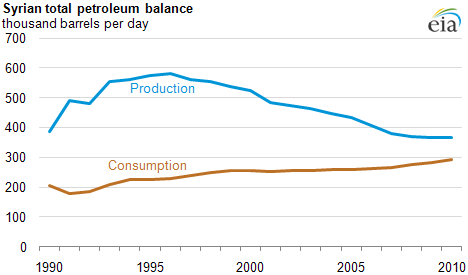 Declining oil production has been the main driver of lower Syrian oil exports (see chart below). Efforts to reverse the declining trend for production and exports by expanding exploration and production through partnerships with foreign oil companies have been hampered by U.S. sanctions. Recent political unrest in Syria and the indiscriminate use of deadly force against dissent by the Syrian government has prompted further U.S. sanctions, including a ban on the import of crude oil or petroleum products of Syrian origins. On September 2, 2011, the EU, whose members purchase over 90% of Syrian oil, announced a ban on imports of Syrian crude oil, which may further hinder Syrian efforts to expand their petroleum industry. Syria has opened its offshore territory for development; however, this region is expected to contain mostly natural gas. The Syrian Ministry of Petroleum and Mineral Resources and General Establishment of Geology and Mineral Resources has also opened up bidding for shale oil deposits containing an estimated 285 billion barrels of oil. This new exploration, plus rehabilitation of current oil fields, may help counter the current decline in petroleum production. Although Syria is not a major producer of oil and gas, it occupies a strategic location in terms of prospective energy transit routes and regional security. EIA's Country Analysis Brief on Syria features additional analysis on these trends, along with a broad discussion of Syria's energy sector.